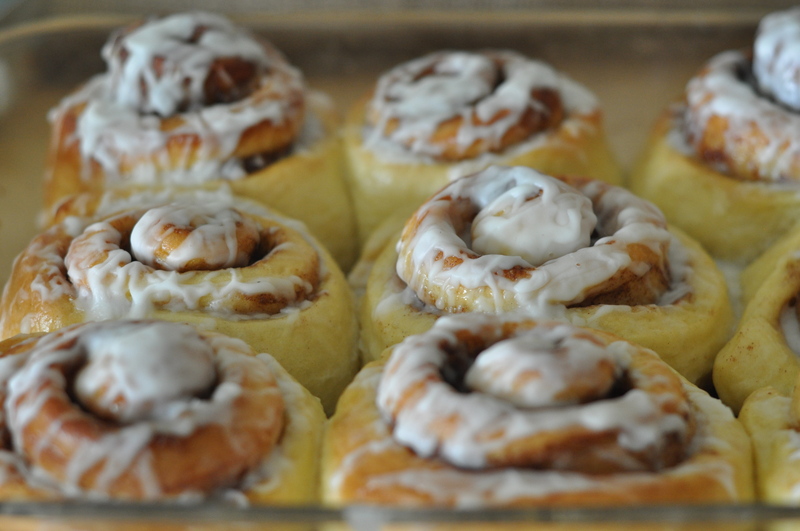 When I think of cinnamon rolls, I immediately think of Cinnabon, the popular food franchise that you most often see in mall food-courts. Though I typically don’t eat at mall food-courts, I definitely love the smell of Cinnabon cinnamon buns! Honestly, I don’t think I have ever purchased one for myself to eat. Don’t get me wrong, I love them, but the thought of how guilty I would feel after indulging one is enough to prevent me from actually ordering it. But, every once in awhile, an indulgent is good, right? 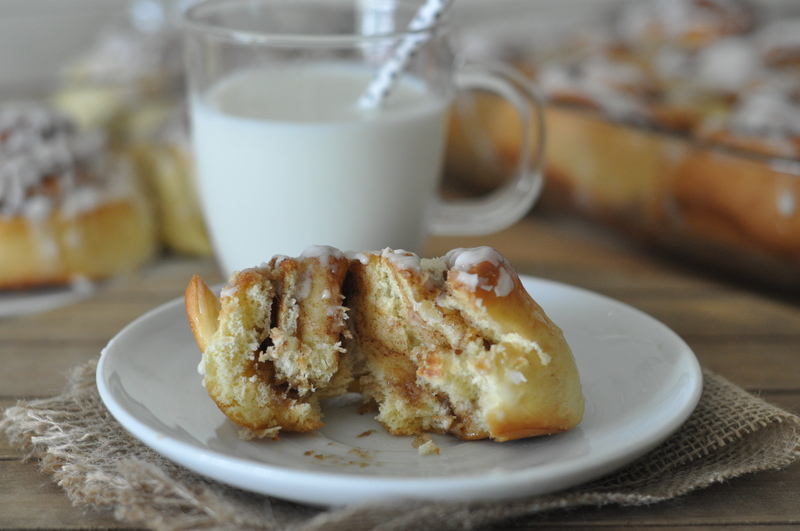 So this past weekend I wanted to indulge and decided to make some cinnamon rolls. I wanted to start with the basics- plain o’ cinnamon rolls- no nuts or raisins added. I knew I didn’t want cream cheese glaze because cream cheese can be overpowering. So I decided on a sugar glaze, flavored with a bit of Bourbon, borrowed from my husband’s Whiskey collection. The best part about baking these at home is the aroma that fills the place as they finish in the oven. Even better, you don’t have to wait until they are fully cooled to eat them…they taste the best when they’re piping hot! 1. In a mixer bowl, gently mix together the milk and yeast. Let this mixture sit for about 10 minutes. 2. Add sugar, eggs, flour, salt. Using the dough hook attachment, mix on low speed until the dough comes together. 3. Once all the ingredients come together, add the butter chunks. Continue to mix until no butter chunks are visible and no dry ingredients are left in the bowl, about 5 to 8 minutes. If the dough feels too sticky, sprinkle in some flour. 4. Place dough into a slightly greased bowl. Cover loosely with plastic wrap. Let rise at room temperature for at least 2 hours. (I left mine to rise for about 5 hours). 5. For the filling: in a clean bowl, mix together the brown sugar and cinnamon. Set aside. 6. After two hours and the dough has doubled in size, cut the dough in half. Set one half aside. 7. With the other half, roll out into a rectangle until it is fairly thin. 8. Spread half of the softened butter on the dough. Sprinkle half of the brown sugar-cinnamon mixture so that it covers the butter. 11. Place pieces in a greased pan. Cover loosely with plastic wrap. Let rise for 40 minutes. 12. Using a fork, whisk egg and water together. 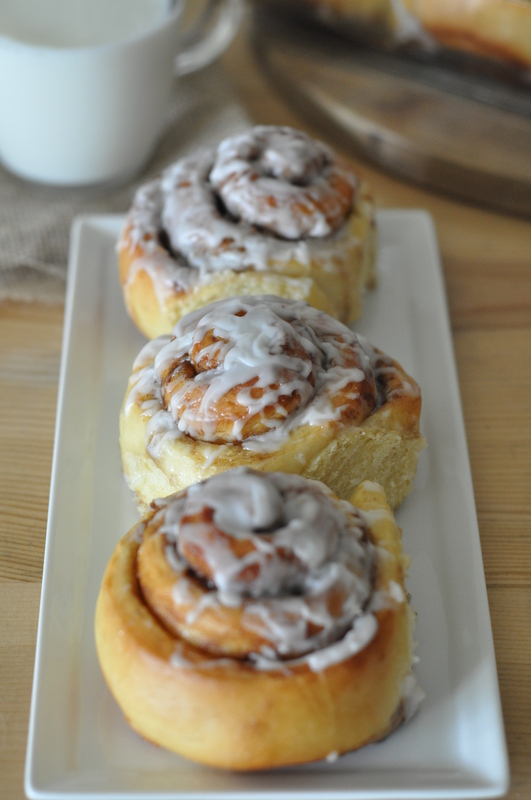 Brush cinnamon rolls with egg wash right before baking. 13. Bake at 375F for about 23-25 minutes. 14. These can be immediately glazed once out of the oven. 1. In a mixer, whisk together powdered sugar and milk, adding the milk 1T at a time. 2. Add Bourbon. 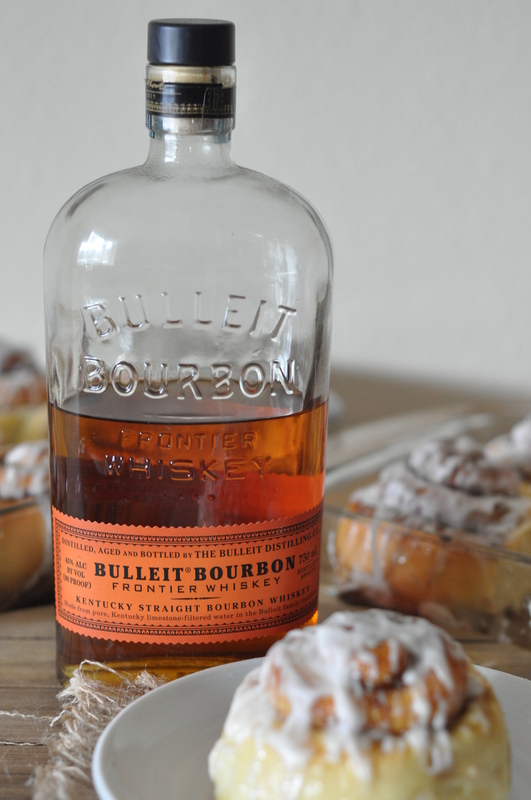 Add more milk or Bourbon to adjust the consistency as needed.